KASCO manufactures and stocks a diverse line of products which we supply to numerous retail, wholesale, and commercial businesses. Our products include a wide variety of the metallic, sharp edged cutting products we manufacture, as well as seasonings, cutlery, and commercial food service supplies. We service and supply a broad base of customers: from independent grocery stores, butcher shops and bakeries to large supermarket and retail chains, meat processing plants, and wholesale distributors. No customer is too big or too small for KASCO! KASCO meat grinder plates and knives are designed to minimize contact between the plate and knife, reducing heat and creating a cool cutting surface. This results in a fresher and more visually appealing product, which also extends product life. A sharp and long-lasting cutting surface helps produce consistent product and reduces waste from poorly cut and mashed meat. KASCO meat cutting band saw blades are constructed from durable materials to ensure quality and reliability. These blades are engineered for specific cutting applications from fish cutting to carcass splitting. All blades are designed to lower cutting costs by generating efficient cuts and producing less waste. 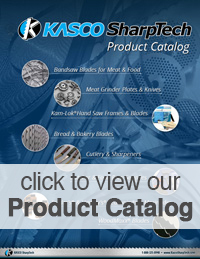 KASCO bakery slicer blades are made with a commitment to quality and innovation. Our quality assurance procedure makes sure our cutting and slicing edges meet the strict standards, which makes KASCO a global symbol of dependability and service in the blade manufacturing industry. The intensive control measure that are integral to the production of our bread slicer blades include the examination of all incoming raw materials during every stage of production. Cutting edge WoodMaxx Blades and PalletMaxx Dismantler Blades are the result of 110 years of experience and the KASCO commitment to design and manufacture the best band saw blades in the industry. These Blades have precision ground teeth that create straighter and more accurate cuts. In addition, WoodMaxx and PalletMaxx blades are made from quality and durable materials to increase product life and decrease safety hazards for employees. The difficult process of cleaning your meat and deli department is made simple when you use Lubricoat Food Equipment Oil. Spray this food grade lubricant on your machines and the coating action will prevent food by-product from sticking to machine parts, making cleaning quick and simple. Lubricoat also lowers repair costs and extends equipment life by creating a barrier that reduces equipment destroying heat and friction. The KASCO cutlery line is made from high-carbon stainless steel and offers a corrosion and wear resistant blade. Each piece is properly heat-treated for professional cutlery use providing a long edge life. KASCO stocks many types and sizes of Victorinox and ICEL cutlery. Some of our cutlery has wood handles, while most include injection-molded polypropylene handles with non-slip coating that adds an extra firm grip, sealed construction, and a natural left/right hand fit. Hand crafted using the finest materials, our Kam-Lok™ professional butcher saws have been hand-crafted since 1909 using the finest materials available. We start with high quality stainless steel bar stock, then precision cut, shape and form it into the butcher saw frame. KASCO offers a wide selection of common meat room and deli butcher supplies. We've developed a sophisticated logistics network to manufacture and purchase quality butcher supplies around the world. This ensures our inventory is in stock and ready for immediate delivery to your business location. Snider's and Harvey's seasonings and sauces bring spice and life to meats and entrees. A unique selection of seasonings, spices, sauces, marinades, and a variety of applications make Snider's and Harvey's seasonings a great addition to any meat product line. Simply add KASCO seasonings to your products and create a unique taste that keeps customers coming back.